From RTE post dated October 28, 2012 (two & a half years after ObamaCare was passed) – "Now the ObamaCare law may have taken another turn during the past few days. The October 14 posting on RTE mentioned that 'Oklahoma has filed a new legal challenge re employers being fined in Oklahoma where they – & several other states - do not intend to set up & run their own health insurance exchanges.' This idea of the Oklahoma AG is starting to get legs - I read several investigative reports last week that concluded the IRS does not have the authority under ObamaCare to assess penalties against employers in states where the state itself did not set up the specified health insurance exchange. It is estimated that about 30 states will not set up the health insurance exchanges thereby leaving it up to the federal government (Secretary of HHS – Kathleen Sibelius) to do so in accordance with the law. The rub & the Oklahoma AG's claim is that the tax assessments by the IRS are not allowed against employers who do not furnish health insurance to their employees unless the states set up the health insurance exchanges. This interpretation could affect 12 million people including 250,000 in Oklahoma. The deadline for states establishing health insurance exchanges, or not, is November 16. Sixteen states (led by California) & DC have already established health insurance exchanges & seven states (led by Texas) have said they will not establish health insurance exchanges. The stage is set for the next round of legalities." And the start of the next round of ObamaCare legalities began last week with a 2 to 1 ruling by a three judge panel of the U.S. Court of Appeals for the District of Columbia Circuit that found consumers in states with federally run health insurance exchanges could not receive subsidy support for their premiums. Two hours later another three judge panel – this time for the U.S. Court of Appeals for the Fourth Circuit in Richmond – unanimously came to the opposite conclusion. The 7th & 10th (the one that Oklahoma is in – see above) Circuit Courts are also hearing similar cases involving whether or not a health insurance exchange had to be set up by a state – not the federal government for that state - in order for a policy holder to receive a subsidy to help pay for the policy premium. Now it cannot be clearer that the statutory language of the ObamaCare bill says that in order for a policy holder to receive a subsidy support for their premiums the policy must have been obtained on a health insurance exchange established by the state – not the federal government. BO says that regardless of what the statute says the intent of Congress was for everyone to get the subsidies. Just check the wording in the bill to find out the first point is literally true & lord knows BO's point is true as far as it goes - BO & the Democrats intentions are for every "have not" to receive every subsidy imaginable @ taxpayers expense. The problem between the above two positions in tension for BO is that it was Congress's (& his) intention to encourage every governor to get behind the ObamaCare legislation by offering federal tax credit subsidies to residents of states that operated their own health insurance exchanges – not health insurance exchanges operated by the federal government. Accordingly, both the statutory language & the narrow intent of the writers of the legislation favor upholding the DC Circuit Court's ruling. In short the bill means what the words say. But enter the political into the legislative analysis. So far six judges have heard the case & the result is 4 to 2 in favor of BO (2 Republicans versus 1 Democrat in DC & 3 Democrats, including two BO appointees, versus no Republicans in Richmond). BO's plan is to ask the entire DC Circuit Court to hear the case – BO packed this court with Democrat judges (seven of the eleven judges are Democrats) after the Democrat controlled Senate broke the decades long Senate filibuster rule in 2013 to little notice while most people were more interested in asking BO to concentrate on improving our economy, working on job creation, & more recently stopping the flow of illegal aliens across our southern border as if BO had any interest in any of this whatsoever. The sooner people learn that BO is not pursuing the same goals as every other president in our history the better. But in a vivid example of some elected representatives being interested in things other than the general Welfare of the United States I wonder why we need a court case @ any level to determine what Congress wrote or what Congress intended by the voluminous ObamaCare legislation. Since Congress is still there we could just ask them – although it would not be the same Congress as in March 2010 when the legislation was passed. We could ask individual members what they meant when they voted for the legislation – this might get embarrassing. If everyone wanted to help – which they don't - we could take the benefit of the past four years experience of painfully finding out what is in the bill & simply updating the legislation to take into account all that we have learned – including repealing it. Of course this will never fly until noon on January 20, 2017 @ the earliest. Since asking Congress isn't going to answer the question the next best or even better thing is to ask the people who actually wrote the legislation. MIT Professor Jonathan Gruber was one of the main authors of the ObamaCare legislation. Professor Gruber made numerous appearances on TV over the past four years explaining & defending ObamaCare. Click here to see & hear Professor Gruber answer a general question in January 2012 about whether or not the federal government will run health insurance exchanges if the states don't – he went out of his way in answering the question to say "if you're a state & you don't set up an exchange, that means your citizens don't get their tax credits. . . I hope that that's a blatant enough political reality that states will get their act together & realize there are billions of dollars @ stake here in setting up these exchanges." Start @ 31.25 on the video – it takes less than a minute. The importance of these judicial decisions, including the two that have not been finalized, is that there is much more @ stake for ObamaCare & the nation than whether or not people are going to get health insurance policies that are substantially subsidized by the American taxpayer. The issue regarding whether or not subsidies are part of a health insurance exchange can trigger penalties against employers who do not purchase the mandated ObamaCare level of coverage – the tax penalty for the delayed ObamaCare provision known as the employer mandate does not come into play until an employee does not get specified coverage through his employer & goes on an exchange & receives federal subsidies for purchasing insurance. If the DC Circuit Court ruling holds there will be no subsidies in the 36 states that did not set up their own exchanges meaning there will be no penalties against businesses who ignore ObamaCare in such states. In turn employees in this scenario will either pay the full unsubsidized healthcare insurance premiums or will go without healthcare insurance & accordingly will be charged a tax penalty for not having the mandated healthcare insurance – either way people in these states will have a much higher financial burden than people in states that did set up their own health insurance exchanges. Now this appears to have all the ingredients necessary to unravel ObamaCare – & it might. To opponents of ObamaCare on the surface this all sounds good – but stop & think what pressure this puts on governors in the thirty six states who opted out of running their own state exchanges. What will their constituents (i.e., electorate) think especially after their political opponents point out that the average size of a federal subsidy in 2015 is estimated by the CBO to be $4,250 meaning that the federal government pays three quarters of the health insurance premium – right in line with the ratio paid by the federal government for Medicare Parts B & D. There are already signs that some states are folding under this pressure – Idaho, Nevada, & Oregon have each taken the position that their exchanges are state-based no matter who runs them. So we are about to find out who would not be interested in obtaining health insurance coverage @ 25 cents on the dollar – like someone who has the sense to realize that all of the entitlements add up to a destruction of our way of life. It is a testimony to the American can-do love of liberty spirit that the deterioration of the numbers in the above graph is not worse than indicated. It has taken almost eight years since BO became a national figure & over five & a half years since his first inauguration for many Americans to figure out what is happening to their lives – & it's all for the worst & by BO's purposeful design. Please note that there is an over lap with the GW Bush presidential years on the above graph so the stage was unwittingly but nevertheless neatly set for BO to keep the destructive momentum going by focusing on his only real concern – namely making every American dependent on government which of course by definition means a corresponding simultaneous loss of liberty. An analysis of June's employment report is the latest evidence. The BLS reported – on the surface - that the economy added a net of 288,000 jobs in June – not what is needed to grow the economy but better than any other month under BO. What was not reported by the hostile anti American media is that 523,000 full time jobs were lost in June & only 12,000 of the 288,000 net jobs added were full time jobs – 276,000 part time jobs were the net addition, the wages of which could not support an American family without the help of wealth spend down or government programs meaning a decline of American wealth either way. Finish the arithmetic yourself & you will find that there was a total of 799,000 part time jobs added to the economy in June. Under the implementation of BO's destructive plan for America three people have left the workforce unable to find employment for every net job created since BO took office. The decline of $4,000 in real inflation adjusted median annual household income during BO's so called economic recovery means that gainful employment & wealth building in America are stymied – an obvious example of people losing their self respect & corresponding ability to take care of themselves without government dependent programs while their standard of living continues to decline. But there is an even more insidious development that is becoming all too obvious – namely the makeup of the court system. Statist Supreme Court Justice Ruth Bader Ginsburg is 81 years old & is being encouraged by many Democrats to retire so BO can appoint a younger statist Ginsburg version who will provide (dis)service for decades. Both Originalist Justice Antonin Scalia & swing vote Justice Anthony Kennedy are right behind Ginsburg @ age 78. As we all know many decisions are made by 5 to 4 margins - the court's current make up does provide some apparent balance irrespective of the unconstitutionality itself of the cases the Supreme Court takes. The problem of BO appointing Supreme Court justices for the next two years is extended if a Democrat wins the presidency in 2016 & 2020 meaning that the chances of a Democrat president appointing replacements for Ginsburg, Scalia, & Kennedy are high. You can just imagine the upside down court decisions where right is not distinguished from wrong if the statists hold a 6 to 3 Supreme Court margin. This in turn would also embolden the lower courts in this regard who would lose whatever fear they have of being overturned today. Click here for the link of Bill O'Reilly contemplating a more permanent 5 to 4 statist court – not the 6 to 3 statist court I describe that is every bit as likely. None of this is far fetched to me – the American people were capable of electing BO twice & they got just what they elected. The above scenario describes an America where men & women in black robes decide our futures & We the People of the United States allow our sovereignty to lapse - no longer having authority, power, sway, or control of our own destiny. As a follow up to our magnificent July 4th celebration in America several additional messages have come to my attention. None of these messages are more inspirational than the Guinness Beer commercial entitled "Empty Chair" that was produced especially for the Independence Day weekend & has had over 1.8 million views. An empty chair always signified to me a respect for a great person who used to sit in the chair. In this video a bartender has an obvious respect for memories that she holds by keeping an empty chair & table as we wait to learn who she & everyone else has been waiting for. Most long time readers of RTE will remember (actually never forget) Jon Voight's Open Letter To America that Jon read on the Huckabee Show on FNC in 2010. The points from this letter had been (& continue to be) the theme of RTE ever since BO became a national figure. Click here to see the video of Jon Voight's encore presentation on Huckabee on Saturday night. Jon makes an emotional appeal for a strong America, love of life, & standing up for our freedoms. A Huckabee-Voight presidential victory in 2016 would turn the trick. The judicial branch of government is made up of people – just like you & me. Not superhuman individuals endowed with infinite wisdom but people with normal lives & everyday problems also the same as you & me. In short, judges are not infallible & that includes the nine Justices who sit on the Supreme Court. In fact, they can be & quite often are as political as anyone in the other two branches, or again the same as you & me. Some of the decisions made by the Supreme Court have been terrible. In the Dred Scott decision of 1856 the Supreme Court ruled that Blacks could not be citizens of the U.S – within ten years of this decision over 600,000 American soldiers died in the Civil War. In the Roe v. Wade decision of 1973 the Supreme Court ruled that, although there is no specific mention in the Constitution of privacy rights, abortion was legal based on an unelected judge finding a right to privacy, & therefore abortion, in penumbras formed by emanations allegedly found in the Bill Of Rights - accordingly over 50 million abortions have been performed since this ruling. And of course the ObamaCare decision of 2012 upheld the healthcare law when Roberts joined the four statist justices in deciding that the fine to uphold ObamaCare's individual mandate was indeed a tax in spite of the government's attorney specifically presenting their case to the Court to the contrary. All three cases are abominations with no legal grounds for support. Now the above decisions are not based on the Constitution but rather on the personal judgments of as few as five of the nine justices. The judiciary means to usurp the legislature's authority to represent all Americans throughout the country. Whether or not you agree with the specific outcome of the above decisions I hope you can see the illegitimacy of how they were enacted & prove to yourself that they were not made by men of tremendous wisdom but rather by everyday human beings who saw a chance to impose their own views on all of us. Following this prescription is a loser for all of us sooner or later. This is the potential tyranny of the power of the majority of nine unelected justices if we don't correct the mindset that allowed this to happen to begin with. There are numerous examples of presidents ignoring Supreme Court decisions. Judicial activism has been with us since 1803 starting under Thomas Jefferson's presidency when the concept of judicial review (i.e., the Supreme Court determining the constitutionality or unconstitutionality of the actions of the two elected branches) was determined & claimed by master politician & Chief Justice John Marshall as an appropriate function of the Supreme Court. Jefferson fought this - even literally on his deathbed on July 4, 1826. Andrew Jackson examined a Supreme Court decision in 1832 & ignored it famously saying, speaking of the same Chief Justice John Marshall, "John Marshall has made his decision, now let him enforce it." And Abraham Lincoln ignored a Supreme Court decision (the same Chief Justice who upheld slavery in the Dred Scott decision – Roger Taney) regarding Lincoln's suspension of the writ of habeas corpus. Click here to read the memo from Speaker of the House John Boehner to every House Member in which Boehner says he intends to bring to the House floor legislation that will authorize the House to file suit (to who else but the judiciary) to compel the president to follow his oath of office & faithfully execute the laws of our country. Boehner (as have I) has grown tired of BO not faithfully enforcing the laws of the U.S. "on matters ranging from healthcare & energy to foreign policy & education." Boehner's is a short list – please feel free to add your own starting with thousands of destitute children arriving on our southern border. After quoting chapter & verse from the Constitution in the above memo concerning the president's responsibilities, Boehner writes, with no reference to clauses of the Constitution, "Under our system of government, the Judicial Branch has the power to resolve disputes between the Executive & Legislative Branches." Of course Boehner does not provide chapters & verses from the Constitution for this statement because there are none. This means that Boehner is digging a deeper hole than he already is in by perpetuating the mindset that the Courts are the arbiters of all matter. This memo & strategy provide an overwhelming reason to vote against Boehner & every Member of the House that supports his proposed lawsuit. The most basic of judicial principles under our Constitution is that there has to be an actual legal dispute with injuries & damages for either one supreme Court or such inferior Courts as the Congress may from time to time ordain & establish to accept. Of course I am not referring to either of the two elected branches bringing suit, one against the other, because the Constitution provides specific remedies for disagreements to be resolved with the next election being the ultimate decider. Please refer to The Federalist No. 78 where Alexander Hamilton wrote that the president has the sword & the Legislature has the power of the purse & prescribes the laws but the judiciary has no influence over the sword or the purse. In essence the founders regarded the judiciary as the weakest of the three branches. This is the way I learned it as an elementary school student living in Baltimore who made frequent class trips to Washington. So why do both of the elected branches run to the judicial branch for rulings - one elected branch against the other - thereby giving away their constitutional powers like Boehner is planning to do with the results of the vote on his memo? Stop & think - who would want to bring a suit to a judicial system where four of nine justices framed the Hobby Lobby case as a decision of whether or not religious views should be exalted over extending free abortion rights for women of childbearing age after these four justices found in favor of the abortion rights argument? It doesn't take much to tip the scale against you to pick up the 5th justice. To understand why the elected branches encourage the judicial branch to rule on their fate please begin by recognizing that America has only one big government party & it has two wings – the Democrat & Republican wings. Each wing will slug it out & take turns being in power as long as they each exist. The problem with this setup is that elections have consequences & both Democrats & Republicans want those consequences camouflaged or softened as much as possible. This is where the Supreme Court comes in – minimizing or eliminating the consequences of elections so that the two party (wing) system can continue @ our expense. This question is all the more perplexing when you consider a case like the recent Hobby Lobby decision in which the nine justices split 5 to 4 in determining whether the court should exalt the religious views of a small number of owners of closed corporations over the abortion rights of every woman of childbearing age – which sums up Justice Ruth Bader Ginsburg's dissenting description of the decision. Who in their right mind would want to ask these nine people to decide anything? Talk about a crap shoot. In the Hobby Lobby case the owners of Hobby Lobby had choices other than going to court to find out how the majority of the justices felt about a law that had been passed by the legislature & signed by BO. For instance if the terms of the contraceptive clauses written by HHS bureaucrats – not elected reps – were too egregious for the owners of Hobby Lobby they could have gone out of business putting up to 30,000 people who work in their 600 stores out of work – now there is a consequence of the ObamaCare law that would be very obvious for all to see. Instead five justices found an exception for the owners on religious grounds & the affected women now get their contraceptives by other means. Hobby Lobby made a mistake in bringing the suit & of course the Supreme Court made a mistake to our liberty by accepting the case. The same principle applies to the ObamaCare case of 2012 & look what we got – ObamaCare was passed by Congress & signed into law by BO & is still the law of the land but we also have a dangerous legal precedent to boot where the Supreme Court ruled a penalty is really a tax under Article I Section 8 of the Constitution. But you could say this is just a reasonable compromise instead of the draconian going out of business solution I mentioned. But little by little liberties are taken from us with one of these decisions after another, with the full consequences of the law being masked by Supreme Court decisions that protect the other two branches of government with the only sure thing being that either a Democrat or a Republican will win the next election with the people being taken for a ride. "Reminder: conservatives celebrating SCOTUS today should recall that it upheld ObamaCare. Freedom should never be in the hands of 9 robes." Ben Shapiro's tweet following the Supreme Court decision in the Hobby Lobby contraceptive case on June 30. Further to the last post re the Speaker of the House suing BO & my letter that was published in the WSJ concerning the dangers of the House bringing suit to the judiciary against BO click here to hear Mike Huckabee's analysis of the correct constitutional functions of the judicial branch (starts 3rd panel from far right @ 5:58 & finishes @ 5:59 pacific time mark). Governor Huckabee makes the clear mindset-change point that "the biggest threat to our liberty isn't a terrorist attack – it is surrendering to the heresy of judicial supremacy." This is the second post I have made in the last few months regarding Governor Huckabee's position on the court system & it is identical to the one I have presented for years having learned it in elementary school – both of which are based on the position & intention of the Founders. See The Federalist No. 78: Hamilton. 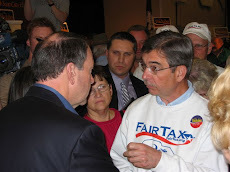 Now Governor Huckabee is not yet an announced candidate for president (really none of them are) but if he does become one we can believe with confidence he will support passage of the FairTax & putting the entire country on the correct path to understanding the proper function & place of the judiciary in our constitutional republic which starts with the superiority of the people over all of the branches of government. 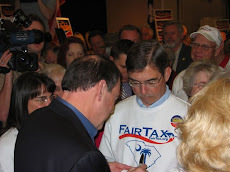 Enactment of the FairTax & bringing about the proper role of the courts are two gigantic issues that will return the country to the excellence of our founding & away from the slide of a mindset of government dependence that keeps drawing us farther & farther away from the liberty to abundance stage of our country.